The MT Boy’s Ballroom Shoe continues to be a popular shoe in our Children’s Ballroom range here at Duo Dance London. A traditionally styled Ballroom shoe finished in leather or patent, perfect for Dance Performances and Competitions and is suitable for all styles of Ballroom and Latin dance. 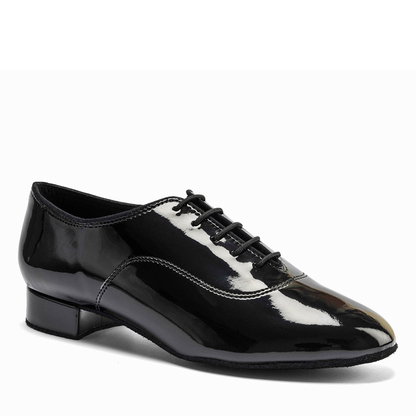 The MT Boy’s Ballroom shoe is a classic, traditional Ballroom shoe finished in soft Black Leather or Black Patent. A lace up shoe with a 1″ Ballroom Heel. It is available in a regular fit and in UK Sizes 1 – 5 NOT including half sizes. Please note that there is no added TAX on children’s shoes and sizes. 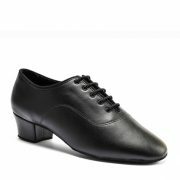 Suitable for all styles of Ballroom and Latin Dance. A sturdy, protective Shoe Bag (again in Accessories). It is sometimes possible to change the heel, width, choice of fabric as a “made to order” option. Please email us at info@duodance.co.uk. “Made to Order” options take up to 3 weeks to manufacture but well worth the wait to have a unique shoe. Dansport/International Shoes may charge a nominal charge for this service.